Boat builders- job well done! LAMP Boatworks has just finished framing the Chaisson Tender, a small rowing gig that has been under construction for some months at the Lighthouse. It’s an important milestone in the building of this particular craft and one for LAMP Boatworks as well. 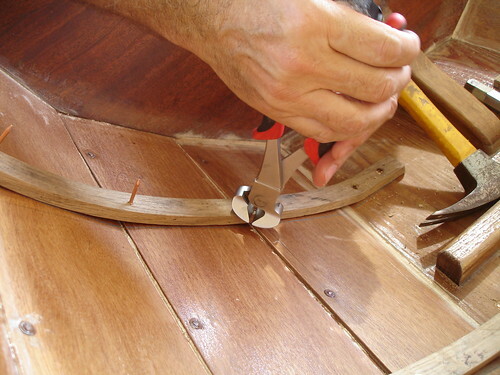 Frames and half-frames, also known as ribs, are important structural members of any boat. In this case half-frames were used and were steam bent, a technological innovation that gives boat builders a leg up in savings of time and materials. Steam bending is an important skill to master and apply and so doing places LAMP Boatworks further down the road toward a first class boatworks. The steam box is a critical component in the steam bending process. The selected wood is first fashioned into the desired final dimensions. The Oak used for the Chaisson Tender’s frames had been kiln dried, a controlled drying process that effects the lignum in the wood in such a manner that it has to be soaked in water previous to steam bending . It is then placed in the preheated steam box for approximately ten minutes. A certain amount of trial and error was gone through to determine the optimum steaming time for these particular half-frames. Larger or smaller timber will require varying steaming times. The steam box is a long rectangular box, in this case made of wood, but which can be made of any material that can withstand steam vapor for a prolonged period of time. A gas bottle and turkey cooker filled with water provide the steam and a small thermometer inserted through a small hole in the steam box permits the monitoring of the temperature. The box has pegs that pass through it’s width and act as shelves for the wood being steamed so that it may be evenly steamed from all sides. After ten minutes at 212 degrees, the half-frames are ready and brought out one at a time. 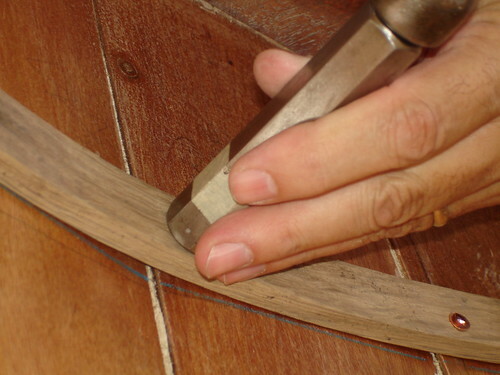 An initial bend is made in the base to fit along the flat bottom of the boat and then bent into place along the interior side of the craft. 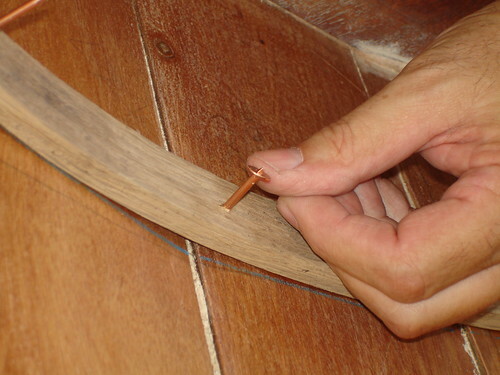 Two screws are then used to hold the foot of the half-frame in place and then pre-placed copper nails are pounded through from the outside through the planking and half-frame. 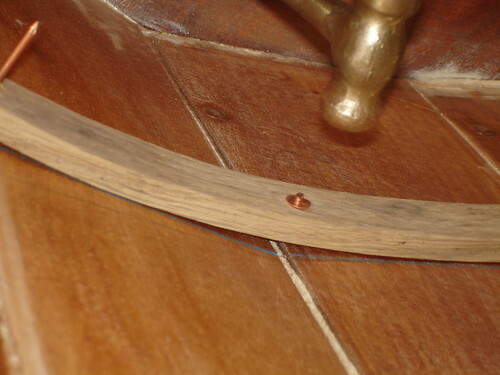 A copper rove, a sort of washer, is placed over the head of the nail and driven down with a rove punch and then the shaft of the nail is cut and peened over to form a rivet. Four such rivets hold each half-frame in place. With the framing of the Chaisson Tender completed, LAMP Boatworks is one step closer to finishing its third and most complicated build to date. 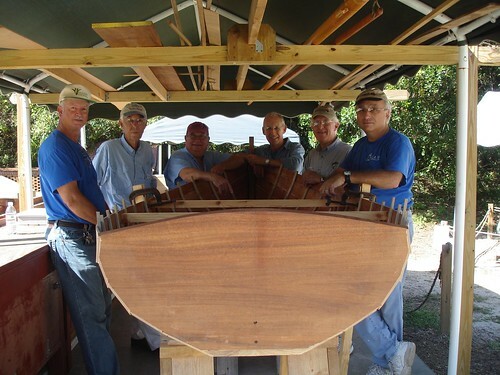 What a great update on the latest LAMP Boatworks project! I didn't get to see the steam box in action, but here it is on the blog/YouTube!